1. In medium bowl, whisk together garlic, oil, lemon juice, mustard, tarragon, lemon zest, salt and pepper. Reserve 1/4 cup oil mixture. Place chicken in large zip-top plastic bag; pour remaining oil mixture into bag. Seal bag, pressing out excess air, and refrigerate at least 1 hour or up to 4 hours. 2. Prepare outdoor grill for direct grilling over medium heat. Remove chicken from marinade; discard marinade. Alternately thread chicken and peppers onto skewers. 3. Place kabobs on hot grill rack and cook 12 to 15 minutes or until chicken loses its pink color throughout and reaches an internal temperature of 165°, turning skewers every 3 to 4 minutes. 4. Meanwhile, prepare couscous as label directs. 5. To serve, toss couscous with reserved oil mixture and place on large serving plate. 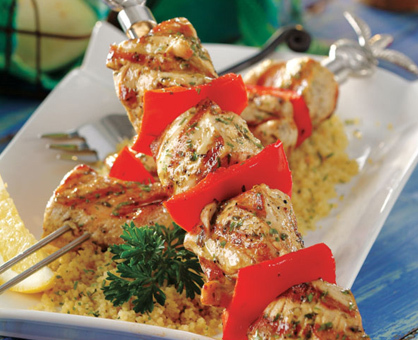 Arrange kabobs over couscous and garnish with lemon wedges, if desired. Choose lean cuts of meat and poultry to avoid high fat.